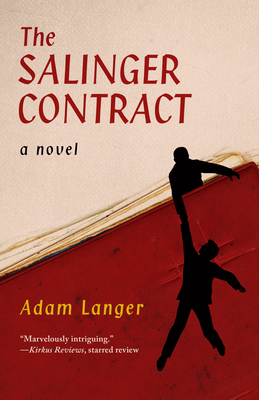 I received a digital copy of The Salinger Contract for review consideration, which didn't influence my opinion of the book in any way. Adam Langer is an emasculated writer playing house husband in Bloomington, Indiana. His life revolves around laundry, dirty dishes, and his daughters' ear infections. Adam hasn't finished writing a story in YEARS--creatively, he's impotent. But all that changes when he happens to meet up with a fellow author, Conner Joyce, a best-selling writer of thriller novels whose star is on the wane. At least, until he's approached by a bespoke Waldo Lydecker type named Dex. Dex has an offer Conner can't refuse: write a novel just for Dex, for two and a half million dollars. The catch? No one else can ever know about the novel or their deal. Of course, Conner accepts. But it isn't long before he suspects he's made a deal with the devil and turns to Adam for help. Like his friend, Conner, Adam uses an excess of detail to make what would be an otherwise outlandish plot convincing. Thankfully this detail does not involve unnecessary clothing descriptions or other crap I don't care about; instead, the details focus on books, which apparently does not bother me at all. For example, instead of reading his kids an unnamed book before bedtime, Adam reads them Lyle, Lyle, Crocodile. Love that. I also found the portrait Langer paints of life in a small university town to be wry, cynical, and dead-on accurate. One of the university professors Langer describes is so exactly like a former professor of mine that I actually checked to see if he ever taught in Indiana (he hadn't). Adam's portion of the book was so realistic and pitch-perfect that when Conner's completely bizarre story began, I was 100% ready and willing to be sold on it. The only glitches that niggled at me were Conner's hesitation in signing Dex's contract—I'd be like, "Givemethatthankyoubyenow." And also, it didn't sound like Conner put any money aside for taxes. I think the IRS would probably notice if your bank account suddenly went up by 2.5 million, don't you? I'll also say that I saw all the twists coming pretty early in the novel. But neither that, nor my little niggles about the tax thing, prevented me from thoroughly enjoying The Salinger Contract and wanting to know what happened next. The thing about this novel is that it tells the type of story that any author or reader would WANT to be true. I mentioned at the beginning of this post that Adam starts the story as emasculated, incapable of creating anything. The same could be said of the other major character, as well: Conner is having problems with his wife, looking at having to sell his house and car, and feeling like his entire career consists of rewriting the same book over and over. Then he agrees to write a novel for Dex and suddenly everything's coming up roses, and not just in the financial department: he's full of inspiration, writing constantly, and his wife and he start trying for another baby. Likewise, in listening to and then telling Conner's story, Adam finds a way to save his family from destitution and discovers who he is—again, not just through money, but by using stories. The Salinger Contract isn't just a fast-paced thriller (though it is that), but a book about the power of stories to inspire people to the point that they're empowered to act out those stories in their own lives. It's also about the connection between an author and reader that's formed through books. It's one the author's usually completely unaware of and not responsible for; but for the reader it feels very personal, possibly because it says more about them than the book. It's that relationship that gives a story life, and one that every author wishes for their work. If you're a reader (and since you're visiting this blog, I'm going to assume that you are) who enjoys mysteries, thrillers, or books about books, I would definitely recommend The Salinger Contract. Oh, and I'm totally drinking at the Coq d'Or the next time I'm in Chicago. Cuz you never know.